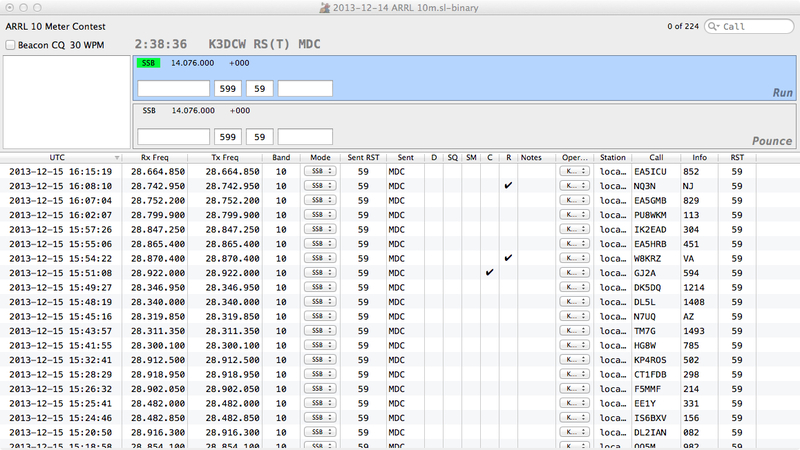 Bill Myers, K1GQ, released version 2.0.13 of his contest logging software SkookumLogger. In 1T1R or 1T2R, when Pounce has keyboard focus and the “Fills QSO entry from nearby activity” option is on in Activities preferences, tuning the receiver within Frequency Tolerance of an activity table entry snaps the radio receive and transmit frequencies to the activity frequencies. In 2T2R, the same behavior applies for each radio when the radio submode is Pounce. Previously the activity was copied to the QSO entry fields but the radio was not changed, so the option did not do the right thing when the activity had QSX information. When you tune rapidly, the radio may snap back to an activity that you just tuned past; this is normal behavior. Once the radio has snapped to an activity, you can continue tuning without causing another snap as long as the QSO call field content matches the activity call. Added DC as a multiplier for the North American QSO Party contest. Thanks W2RU, W6SX. Added Portugal provinces as multipliers for Concurso 80 m CW URE Manises contest. Thanks CT1DRB. Modified all RSGB UKAC contest modules to remove M7 multipliers and add B2 bonus points. Modified Score window to show Total score and Bonus points for contests that have no multipliers and do have non-zero Bonus points. Changed 2017 dates for 24 4m UKAC and 6m UKAC contests, some RSGB Club Calls CW and Data contests, and some UKEICC 80m contests. Modified RSGB NFD and SSB FD rules to make them the same (except that SSB FD excludes 160m), including DXCC countries as multipliers and modifications to QSO points calculations. Thanks GØDVJ. A consequence of removal of M7 multipliers was that the shading of worked multipliers (grid squares) on the Maidenhead Map was no longer available. To avoid wide-spread discontent among UK SL users, that display has been modified so that any contest with grid in the received exchange will shade worked grids whether or not they are multipliers. SkookumLogger now removes “CW”, “RTTY” and “PSK31” in DX announcement comments from skimmers, since mode is displayed in the Mode column of Activity tables. The filtered comments are displayed in the Info columns. Substituting contest rules for old logs where the contest name had changed was failing to actually change the rules, and the Cancel button failed to prevent changing the old log.